Claudio Giovanni Antonio Monteverdi (15 May 1567 (baptized) – 29 November 1643) was an Italian composer, gambist, singer, and Catholic priest. 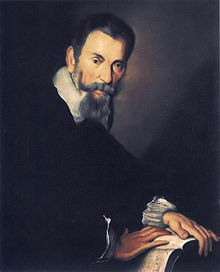 Monteverdi is considered a crucial transitional figure between the Renaissance and the Baroque periods of music history. While he worked extensively in the tradition of earlier Renaissance polyphony, such as in his madrigals, he also made great developments in form and melody and began employing the basso continuo technique, distinctive of the Baroque. Monteverdi wrote one of the earliest operas, L'Orfeo, which is the earliest surviving opera still regularly performed. In 1632, he became a priest. During the last years of his life, when he was often ill, he composed his two last masterpieces: Il ritorno d'Ulisse in patria (The Return of Ulysses, 1641), and the historic opera L'incoronazione di Poppea (The Coronation of Poppea, 1642), based on the life of the Roman emperor Nero. L'incoronazione especially is considered a culminating point of Monteverdi's work. It contains tragic, romantic, and comedic scenes (a new development in opera), a more realistic portrayal of the characters, and warmer melodies than previously heard. It requires a smaller orchestra, and has a less prominent role for the choir. For a long period of time, Monteverdi's operas were merely regarded as a historical or musical interest. Since the 1960s, The Coronation of Poppea has re-entered the repertoire of major opera companies worldwide. Click here to view all items related to Monteverdi.